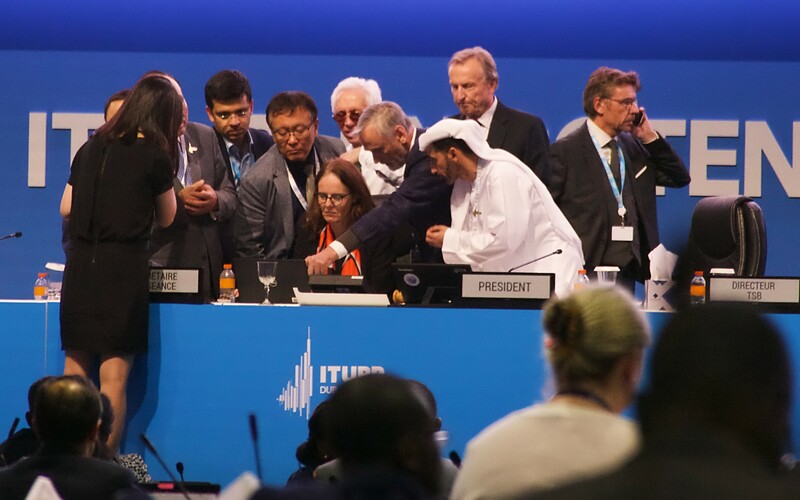 Delegates who were in Dubai for the recent ITU Plenipotentiary Conference 2018 may remember the Chair of the Ad Hoc Group on Resolution 130 (about cybersecurity) regularly reporting on how many pages his group had succeeded in deleting from the original 56-page consolidated draft containing all proposed changes to the resolution. Member States engaged in long hours, including nights, weekends, and almost through to the dawn of the final day of the conference, to slowly work their way through the 18,063 words in the initial consolidated draft of proposals. 13 versions of the Ad Hoc Group’s draft resolution were to follow the first version. And I’m not even counting the versions of the draft that subsequently went to Working Group of Plenary, and then to Plenary, to work on. The final text of the 2018 (English) version of Resolution 130 was 14 pages, with a total of 5,288 words. Even the title of the resolution contains a lot of words: “Strengthening the role of ITU in building confidence and security in the use of information and communication technologies”. It’s so darn long that most people just refer to it as “the cybersecurity resolution”. If you’re an ITU lifer, talking to other ITU lifers, then you just call it “Res 130”. The sheer number of words in the proposed amendments to Resolution 130 were virtually unmanageable. If ITU plenipotentiaries didn’t operate on the basis of trying to work from regional, rather than individual country-based proposals, the situation would have been even worse. As it was, each of the five regional groups had submitted proposals to update the resolution, with one country-based proposal from Brazil on top of that. With only six proposals, though, how did the conference end up with 56 pages of consolidate proposal texts? Partially, it’s because cybersecurity is a very hot topic, and there are very different views within ITU’s Member States about how ITU, and the world generally, should be going about strengthening cybersecurity. Partially it’s because the previous version of the resolution, from 2014, already had a lot of words (3,765 to be exact), and so there were lots of existing sentences that different regions could find issue with, and feel the need to propose amendments to. It seems that the only way to resolve differing viewpoints on a hot topic like cybersecurity is to add a lot more text that sort of reflects each of the different viewpoints, but not in way that satisfies any of the view holders, resulting in the next plenipotentiary conference receiving yet more proposals to amend the seemingly inadequate text that grudgingly received consensus at the previous plenipotentiary. ITU, and other intergovernmental agencies, often view the result of a negotiation where “everyone is equally unhappy” as a successful outcome. But I suspect the reality is that what it often does is simply generate more proposals, more debate, and larger versions of the target resolution at the subsequent meeting. To test my suspicion, I have analyzed the growth of ITU Plenipotentiary resolutions related to the Internet and the information/knowledge society – highly divisive topics these days – and compared them to a handful of other Plenipotentiary resolutions. I’ve included a table including the word counts for all resolutions referred to in this article at the end of the article. “Including, but not limited to, the Internet Corporation for Assigned Names and Numbers (ICANN), the regional Internet registries (RIRs), the Internet Engineering Task Force (IETF), the Internet Society (ISOC) and the World Wide Web Consortium (W3C), on the basis of reciprocity”. Negotiations on these Internet-related resolutions are always fraught and reflect wider geo-political differences on what the ideal international and national governance systems should be. The reality is, though, that only a dozen or so Member States are truly active throughout the negotiations. Others jump in from time to time, either to support the interventions of the representative(s) of their regional group or to comment on an issue they as a Member State have a strong position on. Most Member States remain silent in the room, either because they don’t have a strong (or any) position on the proposals or they have a position that conflicts somewhat with their regional group’s official position, so remain silent for the greater good of their regional group. Below is a graph of how the word counts of these four Internet-related resolutions have grown since their creation (101 and 102 in 1998; 133 in 2002; 180 in 2010). Taken together, Plenipotentiary resolutions on Internet-related issues have grown from a total of 1,225 words, in two resolutions in 1998, to 8,315 words, in four resolutions in 2018. Plenipotentiary delegates are having to wade through almost seven times as many words written in Internet resolutions now as they had to back in 1998. 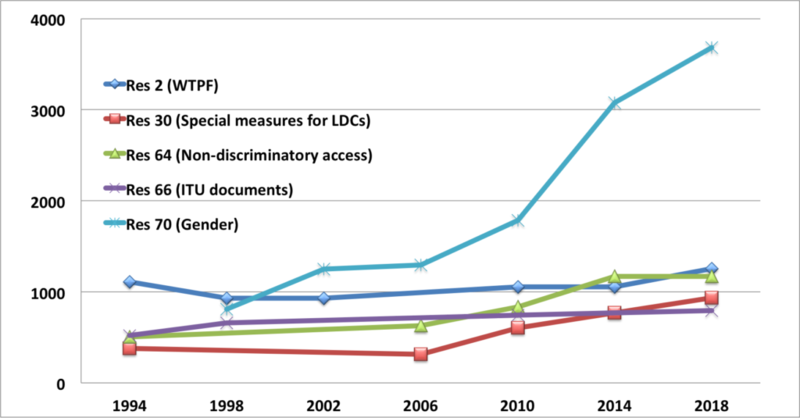 Below is a graph of how the word counts of these four resolutions have grown since their creation (130 in 2002; 140 in 2006; 179 in 2010; and 197 in 2010). Given the relatively short time the above resolutions have been around, it’s hard to draw strong conclusions about the long-term growth of these resolutions, but the same trend to accumulate text as shown by the Internet resolutions appears to be happening here, too. The average rate of word growth for each plenipotentiary that these four resolutions has been updated at is 819 words. The cybersecurity resolution, 16 years after it was first created, is now 16 times as large as it originally was. It only took four plenipotentiaries after its original creation to expand to 16 times its initial word length. As you’ve probably noticed by now, ITU Member States certainly have a knack for developing really snappy titles for resolutions. In a lot of cases, titles started off short and clear, but as more and more ideas have been inserted into specific resolutions, the titles have been expanded to reflect this. In short, general resolution bloat is reflected in title bloat. Below is a graph of how the word counts of these five long-standing resolutions have grown since their creation (all but Resolution 70 were around in 1994). Resolution 64 is basically about the impact of sanctions on ICT development and use by sanctioned countries, so it’s a pretty sensitive topic, but even that hasn’t led to the resolution expanding at anywhere near the rate of the Internet or Information Society related resolutions. In contrast, the gender resolution (70) has expanded significantly in the last two plenipotentiaries. It went from 1,787 words in 2010, to 3,079 words in 2014, to 3,681 words this year. For reasons that I fully don’t understand, gender equality has become a highly contentious topic, with some Member States objecting to ITU spending time on this issue, arguing it’s more important for ITU to prioritise equal regional participation. To me, it feels very odd for Member States to be arguing about this, given ITU’s involvement in EQUALS, amongst other gender initiatives, and the wider UN Sustainable Development Goal 5, on gender equality, that all UN Member States have signed on to, but as always, what a Member State may promote in one UN process may be very different to their stance on the same issue in a different UN process. Go figure. 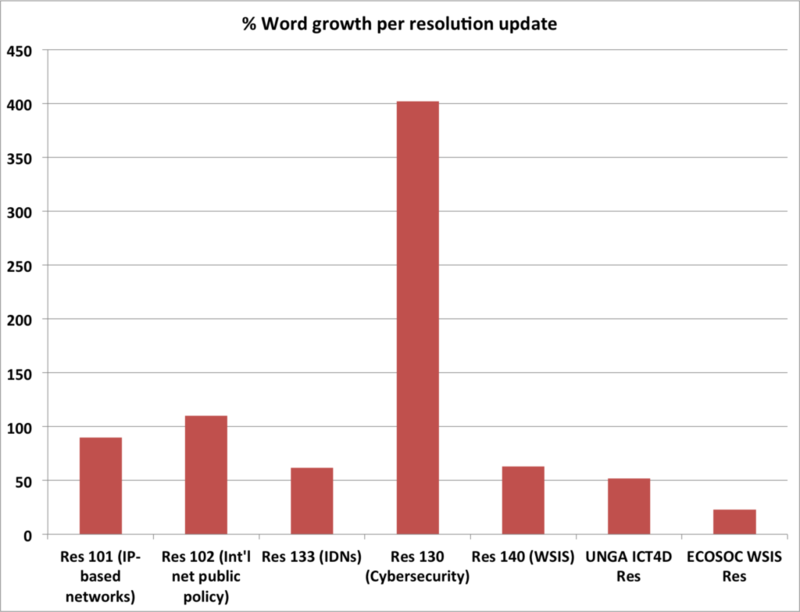 Removing the outlying Resolution 70 from this bundle of older resolutions, the average word increase for the remaining four resolutions at each plenipotentiary that they’ve been updated is 106 words. The resolutions are still growing, but very, very slowly. 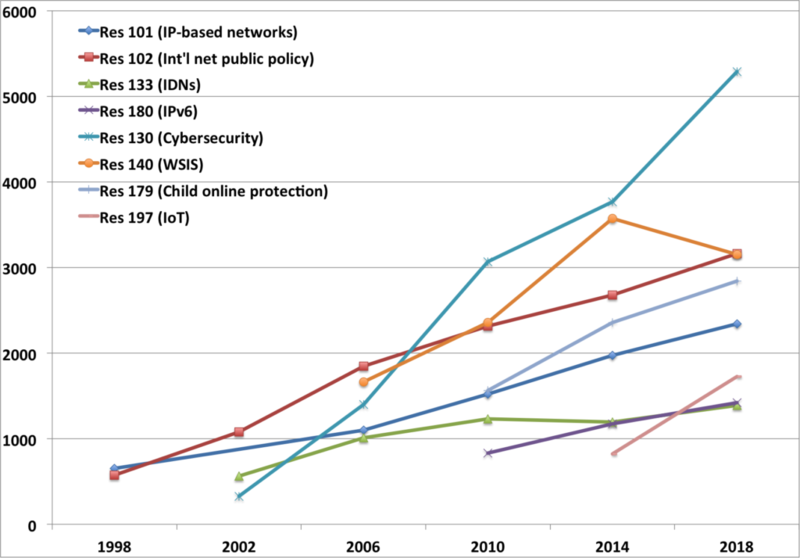 As the graph below shows, there’s an increasing number of resolutions on Internet and Information Society-related issues being created, those resolutions are generally being updated at each subsequent plenipotentiary (many of the early ITU resolutions haven’t been updated in years), and the trend is for them to get bigger each time they’re updated. Notice that the closer to the left side of the bar chart that a resolution is, the larger the relative increase in words. This is because the older the resolution, the more plenipotentiaries it’s been through, and the more chances there have been for Member States to add more content to the resolutions. Also, as shown in the bar chart below, there’s a general trend for Internet, Information Society, and the newer digital applications and services resolutions that arose during the 2018 Plenipotentiary to start life with a larger number of words. 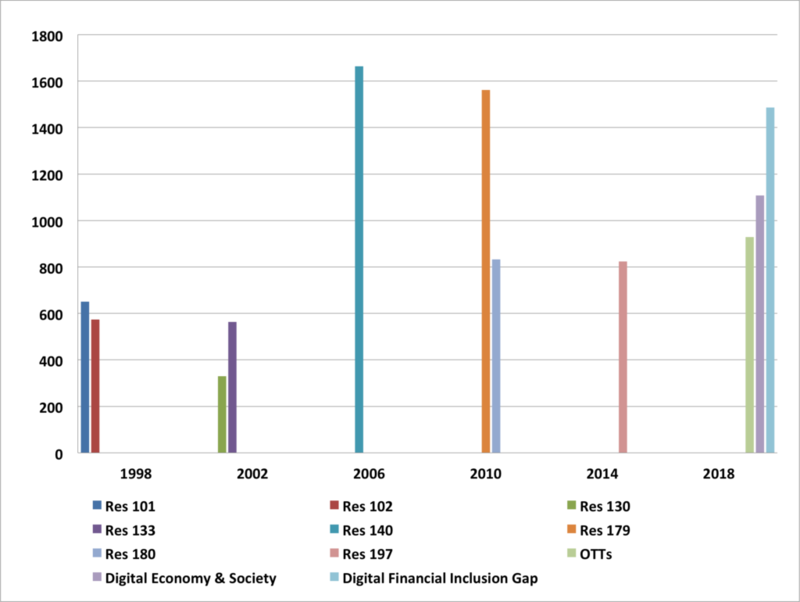 In the above bar chart, please note that what I’m calling the digital applications and services resolutions (Over-The-Top services (OTTs), Digital Economy and Society, and Bridging the Digital Financial Gap) don’t have resolution numbers yet. Because they are so new, they currently are only identified by their Working Group of Plenary resolution numbers, not by the larger schedule of Plenipotentiary resolution numbers. Rather than use the temporary Working Group of Plenary numbers, I’ve chosen just to refer to their subjects. The above chart only refers to 11 resolutions, so is not a particularly large pool of data with which I can conclude that there are strong trends, but there is an overall emerging trend for resolutions in the Internet/Information Society/digital applications and services space to start life in more words as the years have passed, particularly if you remove the two extremely high starting-word-count resolutions, 140 (from 2006) and 179 (from 2010). How do Plenipotentiary resolutions on Internet and Information Society issues compare to similar resolutions in other UN forums? The first resolution at ECOSOC after WSIS was ECOSOC’s first ever resolution on WSIS (2006), so was rather long on explanation. The following year (2007), it was tightened up considerably, resulting in the big drop in its word count. As various governments started to realize that the outcomes from the 2005 WSIS weren’t going to solve all the ICT issues they’d hoped WSIS would solve, negotiations ramped up again, and the word count of the 2008 version of the ECOSOC resolution on WSIS increased. It seems that UNGA had hoped that WSIS would solve all their ICT issues, too, as there was no ICT4D resolution from UNGA in 2005 or in 2006. Instead, UNGA issues resolutions related to the holding of WSIS. By the time they resumed the ICT4D resolution in 2007, their effort was entirely about pushing off ICTs to ECOSOC in a very short, 260-word resolution. When that didn’t seem to work, negotiations started back up, and word count started going up again (1283 in 2008). 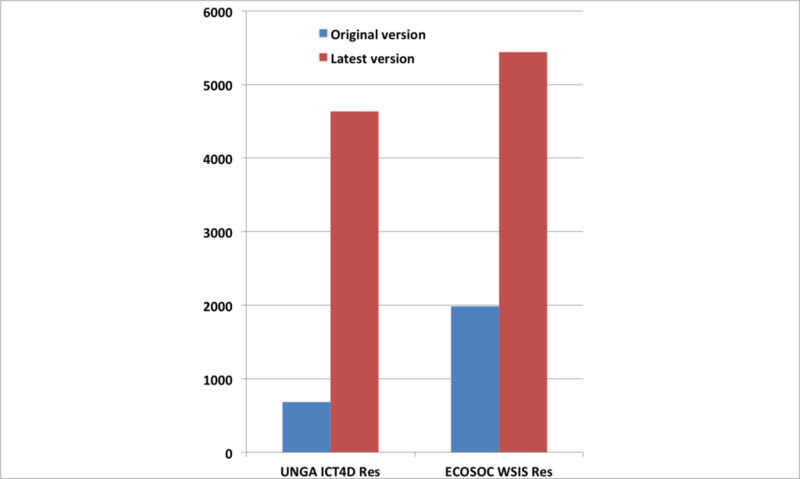 The ECOSOC WSIS resolution preceded the UNGA event, so the word count increased in 2015, but then dipped in 2016, as CSTD Member States (who draft the resolution) debated how best to update the ECOSOC resolution. Very little was agreed on, so very little new material went in, but common sense meant that Member States could agree to take out the existing text talking about preparations for the WSIS+10 event, which was clearly out of date in 2016. 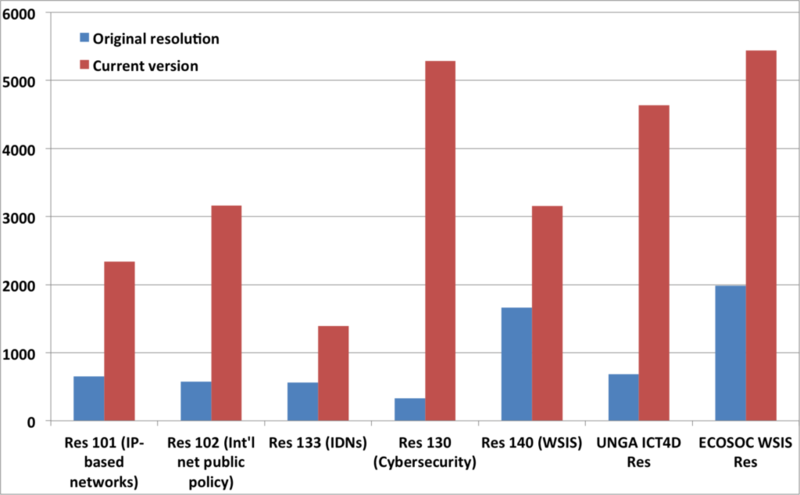 The UNGA ICT4D resolution in 2015 was basically a placeholder resolution, as Member States had been focused on producing the WSIS+10 resolution from the UNGA High Level Meeting that preceded the ICT4D resolution by only a matter of days. 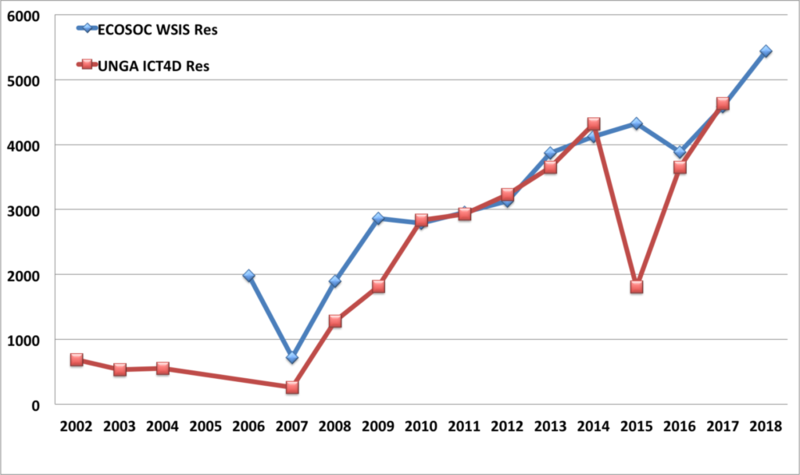 In 2016, though, Member States went back to arguing about what the WSIS+10 resolution meant, and the word count of the ICT4D resolution went back up again. The UNGA resolution has been updated 14 times – it skipped 2005 and 2006, and negotiations on the 2018 version are not likely to conclude until just before the end of December. The ECOSOC resolution, which is actually four years younger than its UNGA counterpart, has been updated 13 times. The average rate of word growth for each UNGA section that the ICT4D resolution has been updated at is 303 words. For the ECOSOC WSIS resolution, it’s 288 words. This means that both the UNGA and ECOSOC resolutions are growing at a slower average pace per update than the Internet-related resolutions (at an average of 360 words per plenipotentiary) and Information Society resolutions (at an average of 819 words per plenipotentiary). 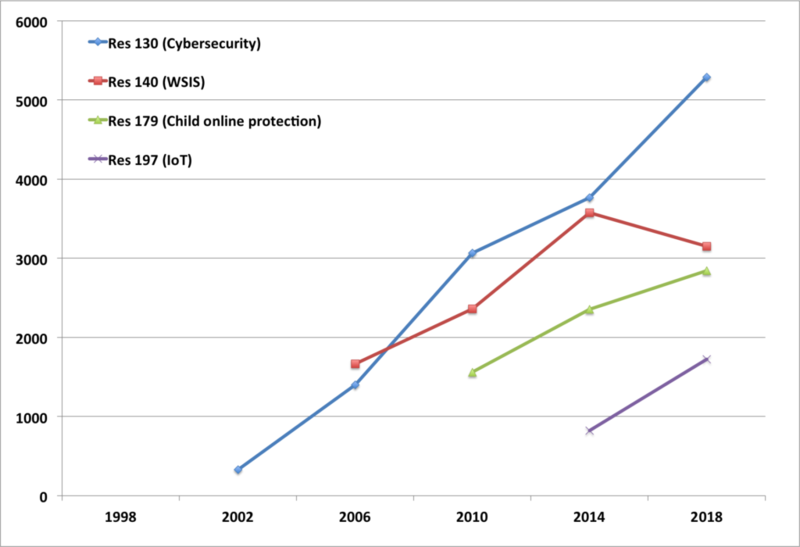 The Plenipotentiary’s cybersecurity is the clear “winner” here, but it’s apparent that all five of the oldest Internet/Information Society resolutions are growing at a faster rate per update than either the UNGA or ECOSOC resolutions. General conservativism in the negotiation process means that when old text is proposed to be deleted, it often isn’t. For example, in Dubai a proposed deletion of a reference to telex in Resolution 133 (IDNs) was opposed as, despite the fact that telex is basically unused technology these days, it is important to continue to recognize ITU’s role in standardizing the use of non-Latin characters in telex. Similarly, Resolution 140 (WSIS) still contains a thank you to the hosts of the two phases of WSIS, which were held back in 2003 and 2005, despite a proposal to delete the thank you message. When you don’t delete the outdated text, but keep adding more up-to-date text, the resolution bloats. Highly contentious issues lead to needing to include references to highly divergent perspectives, but in much watered-down form. The watering down enables holders of opposing viewpoints to accept the inclusion of views they would otherwise not be able to accept, but it also ensures that it doesn’t meet the goals of the original proponents. The result is a lot of text which doesn’t really meet anyone’s goals, leading to many of the Member States re-proposing what they originally wanted at the subsequent plenipotentiary. And because of the contentiousness of the topic, the cycle repeats, and repeats, and repeats. To justify adding more actions in the operative part of a resolution (the “resolves”, “instructs”, “encourages” and “urges” parts) there’s a trend to add more explanatory text to the preamble (the “notes”, “recognizing”, “aware”, “recalling”, etc., parts). For contentious topics, this means that the preamble can bloat significantly, as Member States argue for inclusion of references to other resolutions and activities. For example, the 2018 version of Resolution 130 (cybersecurity) refers to a whopping 17 other resolutions and outcome documents under “recalling”, 18 contributory factors under “considering”, and countless other activities and references to resolutions in the rest of the preamble, all to justify the presence of 12 “resolves”, 37 “instructs” (directed at the Secretary-General and various Directors of the Bureaux), and 13 “invites” (directed at Member States, Sector Members and Associates) and one “requests” (to the Council). There’s a trend to add more and more sub-issues to the topic of a resolution over time. This leads to more text for each of those new dimensions. For example, Resolution 102 was only about the management of the DNS and IP addresses until 2006. In 2006, to take into account the outcomes of the WSIS process, the concept of “international public policy issues pertaining to the Internet” and “enhanced cooperation” were added to the resolution. In turn, this led to the Council Working Group on International Internet-related Public Policy Issues cropping up in the 2010 version of the resolution (between the 2006 and 2010 plenipotentiaries, the ITU Council had created a Dedicated Group on International Internet-related Public Policy Issues). At some point, a resolution may get so weighed down with expanding sub-issues that it may give birth to a brand-new baby resolution. But that hasn’t happened yet with either Resolution 102, or Resolution 130 (cybersecurity). Member States will often try and insert text into a resolution that they hope will be able to help them in another forum. 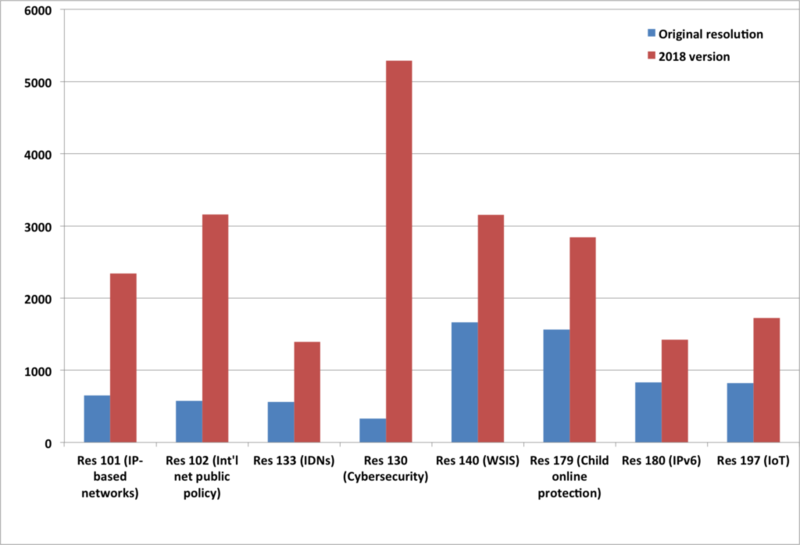 For example, there’s quite a lot of interplay between ITU resolutions on WSIS and the Internet and the ECOSOC resolution on WSIS follow-up. If a Member State can add some advantageous text into a resolution of a forum that is more favourable to their views, they can then use that to justify a proposal of theirs in a forum where their views may come up against more opposition; at that point, the Member State can point to the other forum’s resolution and say “but forum X considers this a vital issue, so this forum must too”. When all these factors converge, you end up with extreme bloating cases like Resolution 70 (gender) and Resolution 130. But sometimes, the contentiousness of the issue can be so overwhelming, it results in absolutely no changes to a resolution at all (for example, Resolution 45, on cybersecurity, at the World Telecommunication Development Conference in Buenos Aires last year); this may mean no bloat, but it also means more lingering bad feeling between Member States. Does it matter if ITU Plenipotentiary resolutions on Internet and Information Society resolutions are bloating over time? It does matter if the trend continues, because larger resolutions provide more opportunities for Member States to find issue with the various parts of the text and therefore propose more amendments, which not only leads to the need for more negotiations, but also to yet more text being added to the resolution. Also, a larger a resolution tends to have more moving parts – that is, they include more references to other resolutions and activities in their preambles (“noting”, “recalling”, emphasizing”, etc. ), and more actions in their operative parts (“resolves”, “instructs”, invites”). As the referenced existing resolutions and activities are updated—and often expanded—elsewhere, it encourages Member States to also change/expand the scope of the resolution that refers to them, both in terms of elaborating on those updates in the preamble, as well as proposing additional actions in the operational section that align with those related resolutions and activities. Another problem that results from the increasing number of interlinked resolutions happens when the interlinked resolutions are all being updated at the same Plenipotentiary, leading to multiple parallel resolution drafting sessions waiting on each other’s outcomes to make updates to their own resolutions. Or more alarming, multiple parallel resolution drafting sessions taking related pieces of text in different directions. Member State only have a finite three weeks to resolve all their differences at ITU Plenipotentiary Conferences. The length of the plenipotentiary is unlikely to be extended any time soon (in fact, their current length has shrunk from four weeks and longer in the past), meaning that the only way to fit in the need for more time for each of the bloated resolutions to be discussed is to schedule more parallel sessions as well as more, and longer, night-time and weekend sessions. The problem with doing this, however, is that most Member State delegations are fairly small and don’t have enough delegates with the appropriate expertise to spread themselves across multiple parallel sessions discussing resolutions on related issues. In addition, scheduling sessions well into the night (and next morning) as well as throughout the weekends results in highly fatigued delegates who are vulnerable to irritability that can reduce progress in negotiations as well as lead to general brain fog that can lead to less-than-optimal decision-making. ITU isn’t the only intergovernmental agency, or even the only policy-making process, to encounter many of the factors that lead to resolution bloat, or to have to then deal with the increasing levels of stress that its delegates are put under to try and resolve significant differences of opinion on increasingly bloated documents. What’s unique for ITU is the fact that digital issues are becoming increasingly important to all of the world’s activities—be they economic, social, cultural, political, environmental or developmental—meaning that the probability of ITU continuing to have a perfect storm of factors leading to bloating resolutions will remain high, and contribute to increasingly difficult negotiations that result in resolutions that are increasingly too labyrinthine and opaque to understand. On 11 October 2011, during the UN General Assembly (UNGA) First Committee general debate, Georgia noted its concern about rapidly evolving cybersecurity risks, and stated its support for UN and UNGA First Committee to include activities on cybersecurity. Georgia’s statement follows China’s statement in the same First Committee, on 7 October, about the the reasons it had worked on a draft international code of conduct for information security with Russia, Tajikistan and Uzbekistan. On Friday 7 October 2011 during the United Nations General Assembly (UNGA) First Committee discussions in New York, China introduced the opt-in International Code of Conduct on Information Security (A/66/359) it co-authored with Russia, Uzbekistan and Tajikistan. The proposed code of conduct is opt-in. Why is this code of conduct important? The UNGA First Committee discusses issues related to disarmament and international security. In the past, this committee has been dominated by discussions on nuclear weapons, land mines and other military matters. But with the increasing importance of the Internet, matters of Internet security are beginning to be discussed too. LEI WANG (China) said that, during the first decade of the twenty‑first century, there have been profound and complex changes in the international security landscape. The global security issue had become increasingly prominent. It not only extended to political, economic and financial fields, as well as public health and energy, but also covered a wider spectrum, from outer space to such new frontiers as cyberspace and polar regions. Also important, he said, was the active pursuit of preventative diplomacy in the prevention of turning cyberspace and outer space into new battlefields . The twenty‑first century had become an era of information. The increasingly wider application of information and cyberspace technologies has helped pick up the pace of development of human civilization. Meanwhile, the security threats on the front of information and cyberspace have constituted a grave challenge to the international community. He said it was against that backdrop that China had joined the Russian Federation, Tajikistan and Uzbekistan as co‑sponsors and submitted a draft “International Code of Conduct on Information Security” to the current session. The co‑sponsors hoped the international community, on that basis, would enter into open, transparent and democratic deliberations , within the framework of the United Nations, with the objective of reaching early consensus on the relevant code of conduct , so as to safeguard the common interests of all parties in this field, and to ensure that information and cyberspace will be used to better promote international peace, security and stability, as well as the well‑being of mankind. It will be interesting to see exactly what is meant by the framework of “open, transparent and democratic deliberations” China and its co-authors propose for the further development of the cybersecurity code of conduct. The Internet ecosystem has long had a mantra of “openness and transparency” and “rough consensus” in policy and standards development. However, many governments have been very uncomfortable with this process, feeling more at home with the structured decision-making at the United Nations.